An all natural product designed to provide long lasting moisture to the skin and assist in relieving itching and irritation. Grahams Bath Oil can be added to the bath water or applied directly to the skin – excellent for cradle-cap and very dry, rough skin. 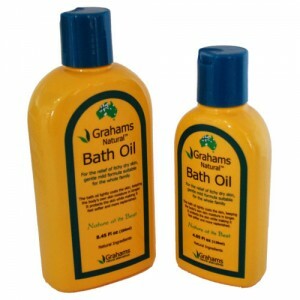 For the best results add a few drops of Grahams Bath Oil to a warm (not hot) bath. Soak in the bath for 15 – 20 minutes. Soaking in a bath of water will dry the skin however when the bath oil is added the effect is reversed and the soaking acts as a very effective way to moisturize the whole body. Apply the Calendulis Plus Cream immediately after bathing. This is when your skin is at its softest and moistest so the cream will be most effective. Emu Oil, Manuka Oil, Apricot Kernal Oil, Olive Oil, Vitamin E Oil, Almond Oil. Clinical studies have proven that 100% pure Emu oil is the most penetrative oil known to man. Emu oil’s unique combination of polyunsaturated fatty acids has anti-inflammatory properties – These penetrate deep into the skin providing deep moisturization. With its combined effects of the naturally occurring vitamin A and E, Emu Oil aids in skin repair and faster healing. As with any product being used for the first time Grahams Bath Oil should be patch tested before use.